Dry weather expected in the India/Pakistan region till 22nd January. Delhi NCR will see hazy sun this weekend with temperatures around 25c. Rain expected on Wednesday 23rd. Mumbai: Clear skies this weekend with days warm around 33-35c. Nights will be around 20c, with no appreciable fall this weekend. Srinagar will be above normal in the day this weekend, with the day temperatures around 11c. Dry weather this weekend, with Low s around -2c. With absolutely dry weather in The North, Hill Stations in H.P. Including Simla and in Uttarkahand (Mussoorie etc ) have not received this year's snowfall yet. Today, 17 Jan 2018, total ice cover is 35.5%. 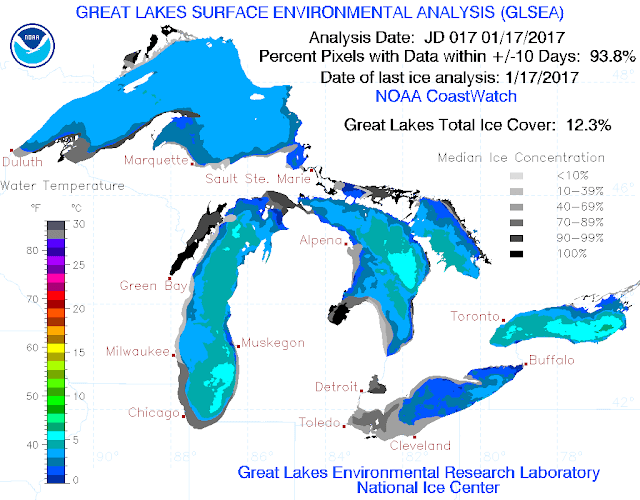 On this date a year ago, ice coverage was 13.5%. This weekend is Tata Mumbai Marathon weekend. Thousands of runners will be wishing for cooler early morning temperature along the route, between 5:40 am to 11 am for some. Looks like a not so cool and also a humid marathon!